The summer season is almost here, which in Japan means summer festivals and fireworks. 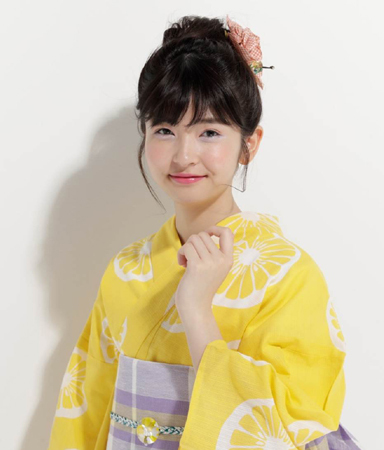 Wearing yukata is tradition during summer here and really gives you that summertime vibe. But to enjoy yukata fashion even more, you’ve got to get the hair and make-up right too. Here’s some tips! Showing us the tricks of the trade is top hair and make-up artist Yumiko Kamada of cosmetics company Shiseido who has incorporated 2018 trends and made it so that anybody can challenge themselves to it. 1. Start off by curling your hair. Depending on how you like it done, it’s good to slightly curl the tips with the curling iron too. 2. Tie your hair from behind your ears to the top of your head to separate the front and back like in picture ②. 3a. Tie each part of the hair you separated close to the top of your head. 3b. For the front, divide the inner part of your hair from the knot into two, and pass the tips of your hair through. Add some nuance to the side with a Gibson tuck. 4. Twist the front and back bundles and bring together. 5. To give the top balance, fix tightly with a hairpin. Add nuance by styling your hair around your face and finish with hairspray. 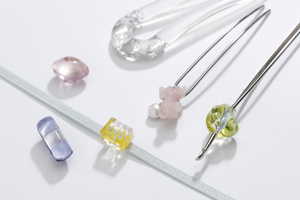 Leave a refreshing impression with checkered hair decorations and transparent glass hairpins. 1. For the base make-up, lightly apply liquid foundation to your skin. 2. Lightly fix with face powder and use highlighter to give your skin shine and luster. 3. Powder your eyebrows to a natural thickness and make soft. 4. Add coral cream eye colour to the outer part of the double eyelid. Apply lavender cream eye colour to the entire bottom eyelid. For single eyelids, close your eye and add the eye colour to the eyelid. 5. Carefully add mascara starting from your lash roots to brighten your eyes. 7. Add pink cream blusher to the upper parts of your cheeks. This brings out the depth of your face and makes your side profile look beautiful. 7. Use a glossy pink lipstick to give a bright look. Lightly shade off the outline to give a lighter look. These multi coloured creams come in paint tubes and can be used just about anywhere from your eyelids to eyebrows, cheeks, lips and so on. There are 14 colours in total (13 coloured and 1 clear). There’s the lavender and coral which was used in this tutorial as well as two new summer colours. Pick them up and get on Japan’s 2018 summer trends! Dress up in a colourful and beautiful yukata and have yourself an unforgettable summer!